Well, here I am, faithful customers! It’s a spring day in VT, which means rain, rain, rain. It’s cold, and overcast, and gloomy as hell, and ya know what? 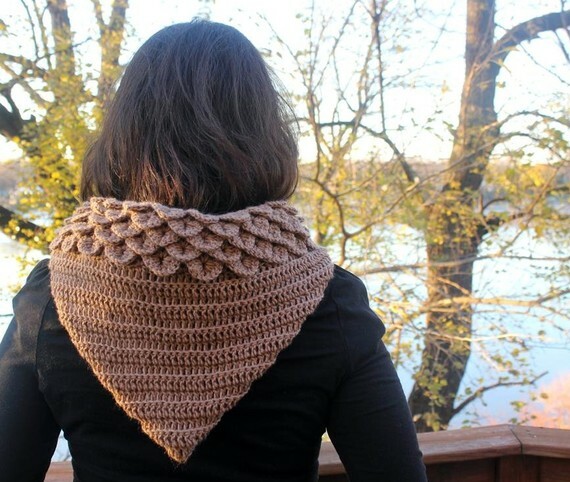 It’s perfect weather to kick out a lot of crocheted goodness!! I’m working like a maniac right now, getting some very large pending orders finished so they can be mailed out this week when I get paid, and starting to accept new orders, so if you’ve been tossing around the idea of ordering, now is a great time! I’d love to work with you to make something wonderful! In the next few weeks, my new website will be launching as well, and I’m REALLY excited to see what Steve, of Steve Mullen Media, has come up with! There shall be e-commerce! That’s right.. order straight through the site for my mainstays!! So yes, big exciting stuff! Oh dear readers whom I adore.. I need your help. 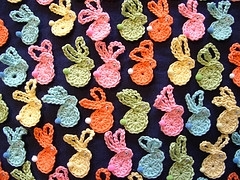 I am trying to get to 250 “likes” on the Neshama Handmade Goods facebook page! Please go and click that little like button, and most importantly, re-post the page and share it with your friends! I’m SO close, and once I hit 250, I will be randomly selecting someone to receive a free gift! Get in on your chance to win!! This is my 100th post here! I can’t believe it.. time is flying! Yesterday was quite lovely.. I spent $15 on myself and felt guilty, but I do have great hair and pretty pink nails now, so I should hush. I never splurge on myself anymore. 🙂 It’s very important to be lovely while crafting!! I’m so excited for the move to VT! there is so much to do.. please get in on my sale and get yourself some great goodies at an excellent price! 30% off on anything made from in-stock fibers, and 15% off anything I have to purchase supplies for. Speaking of fibers, I have some LUSH stuff in stock.. first up is a to-die-for purple and pink blend.. feminine, interesting, so many colors and textures and things going on! 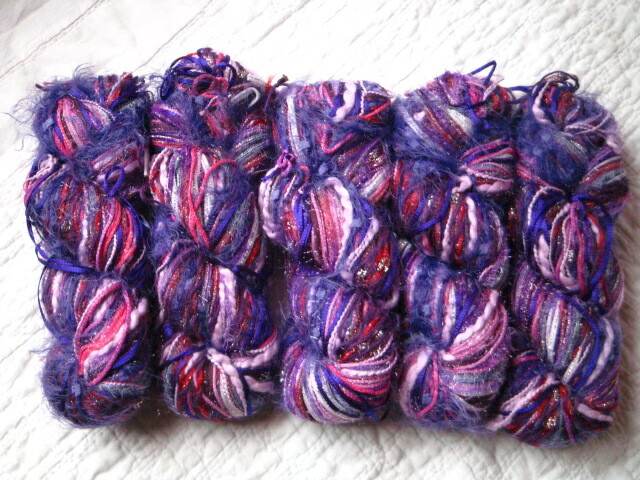 I want to see this made into a shawl, something large to show off the beauty of the fibers.. 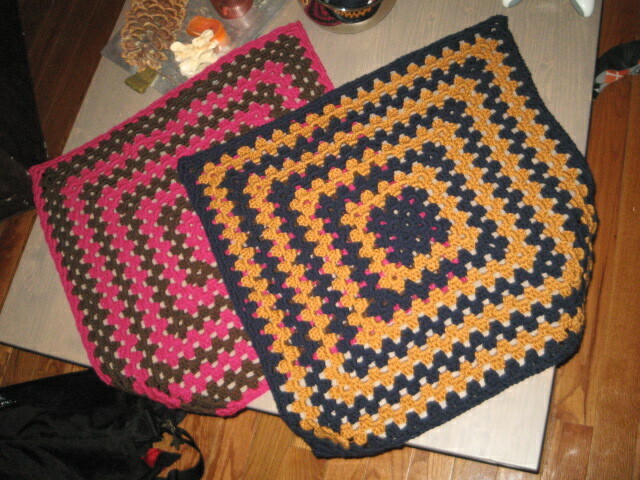 I will do it for $100, shipping included..
Annnd lastly, I have a new item, the Take-A-Long blanket. A sweet little baby blanket in an easy to shlep size of 24″x24″, this is sure to be a favorite with mamas and kids alike! Great size for a little covering up in a car seat (I can make it with a center hole for the buckle to snap in if you’d like) or a stroller, or just as something cuddly to take a long on trips. $40 each, any color combination available!! New Moon and New Surroundings! Well hello faithful followers! Welcome to the month of April and big news!! I’ll be packing up the HQ and moving to the greatest of new digs at the end of the month! Neshama is headed to beautiful Montpelier, VT and into a beautiful sunny space in a great house complete with cats, dogs, kids, chickens and a garden!!! I’m incredibly excited about this opportunity, and really looking forward to more space and a wonderful crafty home. 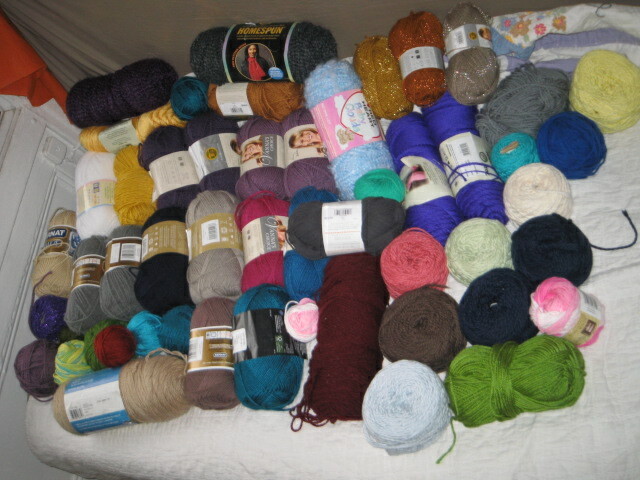 VT is a great place for yarny goodness and fiber arts, and I will also be able to start painting again! This week only, you get 30% off all orders made with IN STOCK fibers. I have a bajillion colors and different fibers and whatnot. If you order something I gotta go purchase supplies for, then it’s a 15% discount! Still a steal!! Mother’s Day is creepin’ up fast, so now is the ideal time to get your orders in to ensure timely delivery.. I’m at about a 3-4 week turn-around right now, please bear in mind. However, I will do my best to get those mama orders out asap. I will be out of the office all day today, March 26th as I’ll be heading out of town for the memorial service for a friend. I will still be reachable by email, and will still be accepting orders. Please remember that tomorrow is the last day for free shipping to Australia, and that 20% of ALL orders until the end of the month will be donated to the American Cancer Society. Also, if you haven’t done so yet, please go over and “like” the Neshama page on facebook. I will be transitioning all work related posts and stuff there as opposed to my personal page, so get in on the inside scoop! 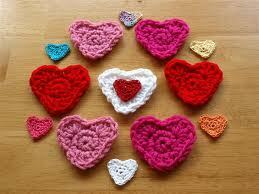 I really appreciate your orders, your generosity, and your love! Yesterday was a sad day here at Neshama HQ as I heard about the passing of two very dear people within just a few moments of one another, totally unrelated. In honor of my friend Melissa, who was one of the kindest, most amazing souls I’ve ever encountered, I am donating 20% of ALL SALES for the rest of the month to the American Cancer Society in her name. If you would like to donate independently, you may do so here. Please.. tell the people in your life that you love them, that you appreciate them, that you cherish them. Be kind to one another, have a little more compassion, and try to help everyone you can. So, I know it’s still a little ways off, but winter-time is approaching down-under, and now is a great time to get in your orders for hats, scarves, and arm-warmers! For my Aussie customers, I’m offering FREE SHIPPING this week, so get those orders in before you hit the slopes in Victoria! As always, email me at neshamahg@gmail.com for more info!